“Ms. Hosseini did not even appear in court to express remorse for her action. She said she objects to the forced hijab and considers it her legal right to express her protest,” Hosseini’s lawyer, Nasrin Sotoudeh, told the Center for Human Rights in Iran (CHRI) on February 5, 2018. Hosseini, 32, has been in detention since January 29, 2018. She was unable to pay the $135,000 USD bail set by the judge presiding over her case. She was arrested on January 29, 2018, for posting a photo on social media of herself standing on a bench holding her white headscarf like a flag on Tehran’s Revolution’s Street. All women in Iran are required to cover their hair and bodies in public. Hosseini is facing the charges of, “openly committing a harām [sinful] act” and “violating public prudency” under Article 638 and “encouraging immorality or prostitution” under Article 639. Hosseini’s lawyer also rejected a senior judicial official’s claim that her client is a drug addict. 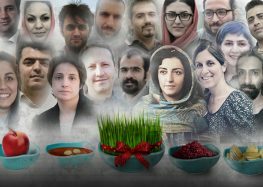 “Despite the Judiciary Spokesman’s false claim, Narges Hosseini has never consumed drugs in her life,” Sotoudeh told CHRI. Iranian officials also accused two protesters who died in detention of being drug addicts. Some detainees in Evin Prison were also told by their interrogators to admit to being drug addicts to speed up their release, according to Sotoudeh. Since late January 2018, at least 29 people have been arrested in cities throughout Iran, including Tehran, Mashhad, Isfahan and Rasht, for joining the “Girls of Revolution Street” movement and posting photos of themselves on social media with their hair uncovered. “We have a population of about 80 million people and the vast majority of our women either wear the chador or have an appropriate hijab,” he said.